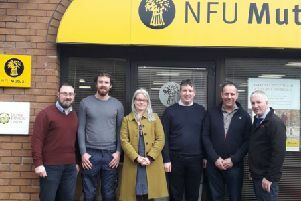 The NW Derry Group has had a busy first half of the year with the Winter Programme coming to an end, BBQs, staff changes and winter barley competition. The year started with the NW Derry group holding its Annual General meeting. Clement Lynch had completed two successful years as group chairman. Members thanked Clement for his hard work and commitment over this period. Alan Hunter was elected as the new group chairman. The group wishes Alan a successful term. Ivor Ferguson the newly elected UFU President was present to address the members about current UFU issues. The group would also like to wish Ivor all the best in his role as UFU President. The NW Derry UFU Group once again hosted a NW Derry Charity BBQ in June 2018. This year the event was in the Limavady Football Club, and was well supported by members. There was a fantastic spread from McMaster’s Butchers who supplied the BBQ, salads and desserts and Conspiracy Band entertained the crowd. A great night was enjoyed by all which raised over £1000 for the UFU Centenary Charity NI Air Ambulance. The event wouldn’t have been a huge success if it wasn’t for the sponsorship of the local businesses. A big thanks must got to Moore Fuels, D&M Farm Services, Cowan Bros., Derry Farm Cottages, Richard Beattie Livestock Sales, T&J Contracts Ltd., WH Nutt, Lacpatrick Dairies, Taylors of Fyfin, Martin Gormley Farm Supplies, AE Engineering, Fane Valley, Fivemiletown Creamery, Pelliper Tree Services, JL Contracts and NFU Mutual Limavady. Once again our members participated in the group Winter Barley competition. Extensive entries were received for the winter cereals competition. Well done to the group winners 1st Boyd Kane, 2nd David Gault, 3rd Michael Kane. We are now taking entries for Spring Barley, Oats and Winter Wheat competition. Contact the office if you wish to enter. February saw change in the Group office with two newly appointed agents Kathryn Taylor and David Oliver. They have settled in well and look forward to meeting members at the Co. Londonderry Agricultural Show in a few weeks’ time. Come along and meet the team. Tea and tray bakes will be available for members’ family and friends. If you are interested in becoming a member of the North West Derry Group please contact the office on 02877762996 to find out more about our exclusive membership benefits and services.